Proto Polynesian *To'a (see below)]. Probably from Proto Polynesian *Nukanuka	Decaspermum fruticosum (A tree with hard wood and medicinal properties): see the page devoted primarily the word mānuka for a full discussion of the possible origins of this word. Proto Polynesian: *Toa	Casuarina equisetifolia (Casuarinaceae). Note: The Casuarina (Ironwood) tree was introduced to Rarotonga from Tahiti. The Polynesians did not take it to Hawai'i; when it did arrive there in the 19th Century it was called paina ("pine"). Māori: Toa "Brave; a warrior". The Māori name Mānuka is shared with two other trees - Kunzea ericoides (Kānuka, Mānuka, Mānuka rauriki), and Leupogon fasciculata (Mānuka rauriki, Mingimingi). An alternative name, rauwiri (also written rawiri and rauiri), is probably derived from a use to which mānuka (and probably also kānuka) was put. See below for further discussion. The Mānuka currently called Leptospermum scoparium by botanists is a very important small tree by any name . It grows to about 4 metres high, and is found in a wide variety of soils in open places. It acts as a nurse tree for regenerating forests. The flowers are very attractive, much larger than those of the kānuka with which it shares a name (over a centimetre wide, compared with a few milimetres). 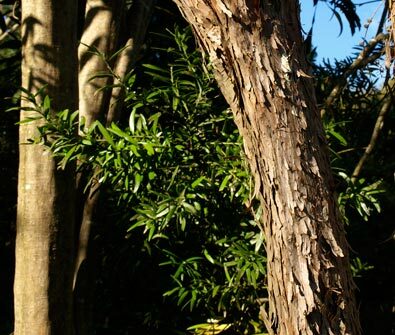 The Kānuka and Kahikaatoa are very similar trees in many ways but the kānuka has soft (rather than prickly) leaves, and several species grow three or four times higher. 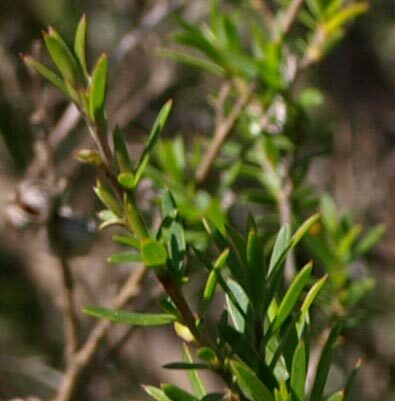 Also, Mānuka (Kahikaatoa) leaves, which have aromatic glands on the undersides, and leaf-tips are aromatic when crushed, whereas the leaf tips of the Kānuka (despite it's also being called "tea tree" in English), are much less so. The wood is very strong and hard, excellent for weapons and agricultural implements. As the proverb notes, as well as for the weapons that could defeat mighty warriors, the kahikaatoa was the ideal timber for wedges used for the felling and dismemberment of large trees, and thus a symbol of what could be achieved by anyone with the requisite determination and resilience. The red wood also makes excellent firewood, which, along with the fashion for clearing land for dairy farms, has depleted stocks of the timber in many places where it was once abundant. However it is a resilient tree in adverse conditions, and can quickly re-colonize abandoned land and act as a nurse tree for regenerating native forest. Bees are attracted to its nectar-laden flowers, and mānuka honey produced from kahikātoa (Leptospermum scoparium) flowers is now a major industry; from being a cheap, everyday honey a few decades ago it now attracts premium prices in New Zealand and overseas, and its production is carefully regulated. The nectar contains a powerful antibacterial agent, methylglyoxal (MGO), which is the result of the transformation of the saccharide dihydroxyacetone (DHA) into MGO, but exactly how this occurs (and how the levels of the "Unique Manuka Factor" in honey from particular locations might be predicted) is still unknown; this is the subject of intense research at the University of Waikato (where the phenomenon was first detected) and elsewhere. There is more informaton about this on the page for the name mānuka. 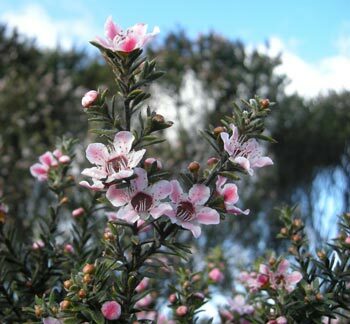 There are currently (September 2018) two named varieties of Leptospermum scoparium in Aotearoa: L. scoparium var. scoparium, which is found throughout the country, and L. scoparium var. incanum (illustrated on the left), a generally smaller shrub or tree usually with pink flowers, although these may sometimes be dark red, and occasionally white. It is confined naturally to Northland from the Aupouri Peninsula to Ahipara, then east to Whangaroa. Some South Island strains of L. scoparium show similarities with Tasmanian plants, but differ in some important respects, including the absence of lignotubers at the base which enable the Tasmanian plants to regenerate quickly after fire. The other strains of L. scoparium in New Zealand are also distinct from their Australian counterparts, and research is now under way which may result in the complete taxonomic separation of the NZ plants from the Australian varieties currently sharing the same specific name. A species of kānuka, Kunzea serotina, is known in the Central North Island as makahikatoa, possibly because it was perceived to have similar qualities to kahikātoa. That is, don't be taken in by appearances of affluence or grandeur! Ki te tūmatakuru, ki te taraongaonga. That is, he would be taught the weapons of war, symbolized by the kahikātoa, so that he could defend himself against formidable obstacles, symbolized by the tūmatakuru (spear grass) and taraongaonga (nettles). Follow the links to the Proto-Polynesian names for more information (and speculation) about the etymology of Mānuka and Kahikaatoa. References and further reading: See linked pages and general works on NZ trees in the bibliography. There is also an interesting account of the unique medicinal qualities of manuka honey on the Royal Society of New Zealand's blog site:	http://sciblogs.co.nz/iaq/2015/04/15/miraculous-manuka/. The NZ Farm Forestry web site has a very informative bulletin on Mānuka blight, based on a paper by R. Zondag (1977). 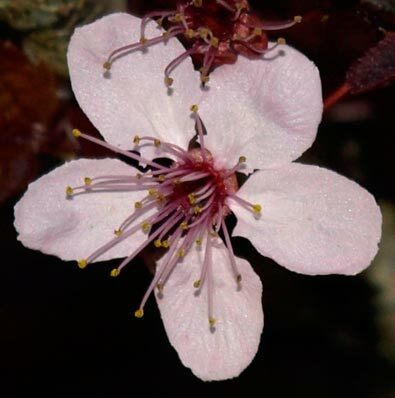 I am indebted to Dr Peter de Lange of Unitech for information about the current taxonomic status of Leptospermum scoparium in New Zealand, and to Dr Jacob Jayne of Analytica Laboratories for information about current research into the special qualities of mānuka honey. 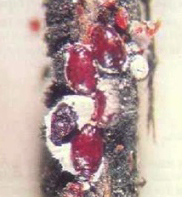 See also the NZPCN web pages on Leptospermum scoparium v. scoparium and L. scoparium v. incanum. 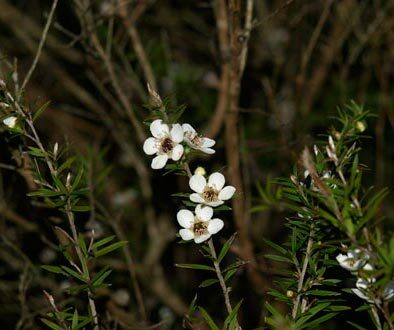 Photographs: The photograph of Leptospermum scoparium var incanum is by the late John Sawyer, (c) NZPCN, and that of Eriococcus orariensis is from the NZ Forest Service. The others are by R.B. (Te Māra Reo). There are more photographs of the kahikātoa on the pages for mānuka (the Māori name and its Proto-Polynesian sources. Note sharply pointed leaf tips.